WASHINGTON — Friday’s terrorist attacks in Paris have revived the debate over whether U.S. tech companies should be required to build “backdoors” into encrypted phones, apps and Internet sites to let law enforcement conduct surveillance of suspected terrorists. There has been widespread speculation among law enforcement authorities and the media that the Islamic State terrorists who attacked Paris were using some kind of encryption technology to communicate. However, American and French authorities have said there is no hard evidence to back up that assumption. Still, the possibility has been enough to renew criticism of commercial encryption, putting pressure on U.S. companies that are increasingly using the technology to thwart hackers and reassure customers that their data will be kept private. “When individuals choose to move from open means of communication to those that are encrypted, it can cause a disruption in our ability to use lawful legal process to intercept those communications and does give us concern about being able to gather the evidence that we need to continue in our mission for the protection of the American people,” Attorney General Loretta Lynch told the House Judiciary Committee Tuesday. 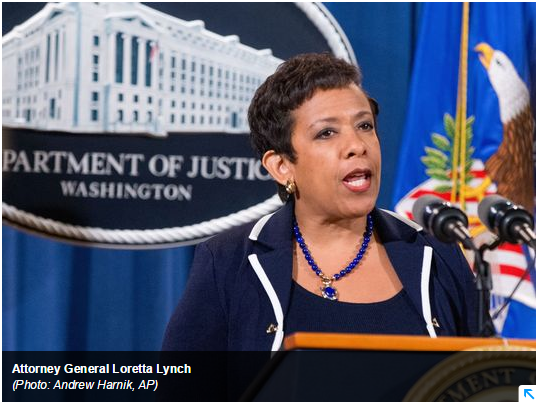 Lynch said the FBI and other Justice Department agencies work with Internet providers to try to find a way to enforce court orders to conduct surveillance of suspected terrorists. However, companies are increasingly employing encryption that even they cannot break to access their customers’ data. In those cases, federal agents use other types of surveillance and intelligence-gathering tools, Lynch said. “But it (encryption) does cause us the loss of a very valuable source of information,” she told the committee. Despite strong criticism of encryption by the FBI, the White House announced in October that it would not seek legislation to force U.S. tech companies to build backdoors to let law enforcement get around the technology to access people’s messages and other information.